It’s 11:30 and you are absolutely dying. Breakfast was paltry, it happened hours ago, and now you’re ready for some serious lunch. This meal needs to fill you up so you can charge through that afternoon like a rhinoceros (a rhinoceros who loves going through email and calling clients). You can’t just make a quesadilla and call it a day; you need something with protein to fuel your body and brain and make you feel highly efficient. 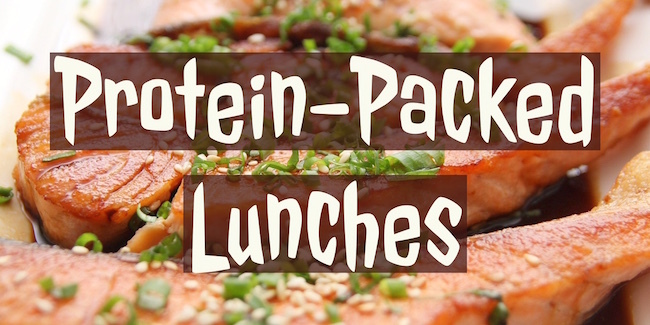 Try some of these quick protein-packed lunches to win the day with just a few minutes of effort. Tuna and white beans combine for some intense protein power in this Tuscan-Style Tuna Salad. Lemon, cherry tomatoes, scallions, and a little freshly ground pepper make for light cool flavors that are perfect on a hot day. Just grab some pitas from the store, pack individual containers of the salad with a pita, and you’ve got a whole week of easy lunches that are cool, fresh, and filling. You won’t even have to turn on the stove to whip it up. Pinto beans, garlic, cumin, and chipotle spiced chicken breast, and quinoa all pack in the protein in this better-than-takeout bowl full of goodness. This one similarly assembles in advance – just make sure to keep your cold and hot ingredients separate so you can easily heat the ones you’d like to warm so they contrast well with the lettuce, tomatoes, cheese, and avocados. Feel free to add additional toppings like salsa and sour cream as you wish. Want something for lunch starring everyone’s favorite superfood, kale? Already missing Thanksgiving? Wrap up some protein-rich deli turkey with sweet pears, cranberry sauce, dijon mustard, and red onion for a wrap with unbeatable flavor and plenty of oomph. It’s low calorie, but not low-profile when it comes to your taste buds. Of course, if you prefer you can use crunchy cabbage instead of kale for the wrap’s exterior (or even a tortilla, pita, or naan if bread is your thing). Vegetable soup is one of my favorite winter lunches, but even a big bowlful can leave you hungry if you don’t throw in some beans. Whether you choose black beans, kidney beans, or lentils, it’s not hard to add a lot of protein from just a small handful of your favorite legume. You can even switch it up from day to day to add variety to your lunchtime. While I like to cook up a big batch of homemade veggie soup, even the canned variety will benefit from a few well-rinsed beans to pump up the protein. A sweet and tangy marinade with flavors of ginger, soy, and brown sugar wraps this chicken teriyaki in delectable layers of flavor and keeps you going throughout the rest of your day. You can serve it with leftover rice that you’ve cooked up in a large batch, or you can simply use a packet of microwavable rice (easy to bring into the office). Asian flavors as delicious as these will make you question why you ever ordered in takeout. Soon, these healthy options will become a regular part of your routine for success. Next PostWhich Is the Right Structure for Your Home-Based Business?